Scott Pruitt, the embattled administrator of the Environmental Protection Agency, has resigned his post as the nation’s top environmental regulator, President Trump announced Thursday on Twitter. Pruitt pursued an aggressive deregulatory agenda during his time at the helm of EPA, including attempts to weaken greenhouse gas regulations for power plants, fuel economy standards for cars and the nation’s first federal rules on coal ash. But his tenure was beset by political and ethics scandals, including his rental of a $50-per night room on Capitol Hill from the wife of an industry lobbyist with business before the agency. Pruitt’s resignation means Deputy Administrator Andrew Wheeler will head the EPA until the president nominates a new permanent leader. Wheeler is a former coal industry lobbyist who was involved in conversations on power plant subsidies last year, but has since said he would recuse himself from discussions on a potential federal bailout for coal and nuclear generators. Pruitt’s departure will likely mean a less scandal-prone EPA that could be more effective at carrying out Trump’s deregulatory agenda, former agency officials and energy lawyers said. Holmstead, now a partner at the Washington law firm Bracewell, said Wheeler’s experience as a lobbyist, an aide to Sen. Jim Inhofe, R-Okla., and a staffer in the EPA’s Pollution Prevention and Toxics office early in his career could help him be more effective than the outgoing administrator. On top of Pruitt’s multiple scandals, EPA officials regularly dealt with reports that their administrator wanted a different job. Just this week, CNN reported that Pruitt personally asked Trump to make him Attorney General, after which he would return to Oklahoma to run for office. Wheeler’s transition to the helm of EPA is unlikely to bring any significant policy shifts, both lawyers said, as Wheeler has been closely involved in the Trump administration’s energy policy, advising the presidential campaign and representing coal mining interests at meetings with White House officials last year. “On substance, I don’t think there’s any daylight between Pruitt and Wheeler,” Holmstead said. That policy agreement likely extends to regulating greenhouse gases, Hecht said. Though Wheeler has questioned the scientific consensus around climate change, the UCLA professor expects him to follow Pruitt’s plan to replace the Obama administration’s Clean Power Plan with a weaker regulation, rather than refuse to write a carbon regulation altogether. 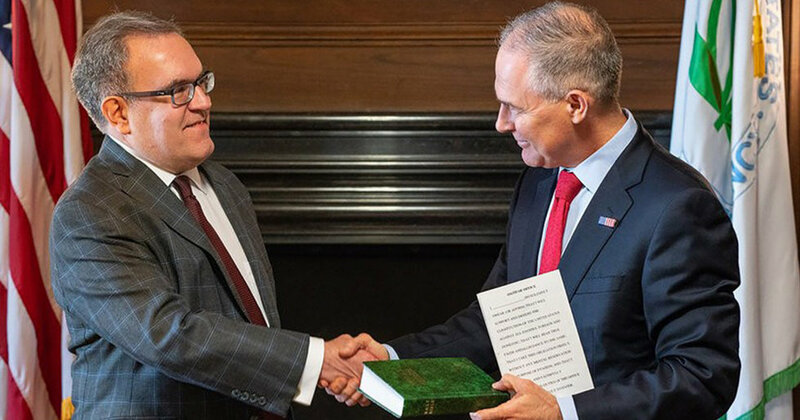 Despite the policy similarities between the two figures, environmental groups cheered Pruitt’s retirement on Thursday — something Holmstead said they may come to regret. Unfortunately, Wheeler’s staunch dedication to Trump’s deregulatory environmental agenda is expected by both the president and green groups. Wheeler is a former government staffer and coal lobbyist with decades of DC experience, which critics and allies agree could aid him in implementing Trump’s agenda without the distractions posed by Pruitt’s soundproof phone booth or unorthodox rental arrangements, POLITICO reported. Wheeler began his DC career at the EPA as a special assistant in the pollution prevention and toxics office, according to his EPA bio. He has now been in DC for more than 20 years, and followed up his EPA post by working for infamous climate change denier and Republican Oklahoma Senator James Inhofe, The New York Times reported. Inhofe once even threw a snowball on the Senate floor to assert that global warming wasn’t happening, according to Vox. Wheeler is one of several former Inhofe staffers, known as the “Inhofe mafia,” who have risen to prominent environment or energy positions in the Trump administration or work with influential lobbying firms, according to The New York Times. After leaving government work, Wheeler worked at a law firm that lobbied for the coal industry, NBC reported. His firm’s biggest client was Murray Energy Corp., whose CEO, Robert E. Murray, donated $300,000 to Trump’s inauguration fund and provided Trump with a wishlist of environmental policies he wanted changed to benefit coal plants, The New York Times reported. “He fought against safeguards to limit mercury poisoning. He fought against protections to limit the amount of ozone in our skies. He fought against air pollution from neighboring states. He’s a climate denier. So, sadly, he fits in well with EPA leadership,” Sierra Club Executive Director Michael Brune told POLITICO. Critics are also concerned that Wheeler’s decades of experience, and reputation as a rule follower, will mean his deregulatory efforts will stand up to legal scrutiny more effectively than Pruitt’s rushed attempts at rollbacks. In his last day at the U.S. Environmental Protection Agency (EPA) Friday, ousted Administrator Scott Pruitt left a parting gift for polluters, and took a parting shot at America’s lungs. Pruitt acted to remove a cap on the number of glider trucks—new truck bodies built without engines or transmission that produce 55 times the air pollution of trucks with new engines using up-to-date pollution controls—through December 2019, the New York Times reported. The Obama administration had worked to limit the number of gliders produced each year to 300, Vox reported. Glider trucks were introduced as a way to recycle older truck parts like engines from trucks damaged in accidents, but, as pollution controls on newer engines improved, some truck buyers saw them as a way to save on more expensive pollution controls that can reduce fuel economy. Glider production had increased from 1,000 in 2010 to 10,000 in 2015, and Obama’s EPA estimated that if those trends continued, the trucks would account for half of all truck-caused nitrogen oxide pollution by 2030. It further found that forcing gliders to use up-to-date engines could save 350 to 1,600 lives over the life of the vehicles, according to Vox. Pruitt’s move reverses the 300 truck cap imposed in January of this year, the New York Times reported. The move was roundly opposed by environmental and conventional trucking groups, including the American Lung Association, the Environmental Defense Fund (EDF), United Parcel Service and the Volvo Group. EDF general counsel Vickie Patton blamed both Pruitt and his second-in-command Andrew Wheeler, who will take over as acting administrator, for the decision. “Pruitt and Wheeler are creating a loophole for super polluting freight trucks that will fill our children’s lungs with toxic diesel pollution, ignoring public comments from moms and leading businesses across the country,” she told The New York Times. An EPA spokesperson told the New York Times the agency hopes to repeal the cap altogether by the end of 2019. The decision comes after Tommy Fitzgerald Sr., CEO of Fitzgerald Glider Kits, the largest glider truck company in the U.S., met with President Donald Trump on the campaign trail and Pruitt after the election, according to Vox. “Our goose was cooked until President Trump and Pruitt came to town, Fitzgerald wrote in The Daily Caller in April. Pruitt also moved to reverse the cap after Fitzgerald donated tens of thousands of dollars to Republican Representative for Tennessee Diane Black, who is also running for governor in the state, and Black asked Pruitt to act on the reversal, the New York Times reported. Pruitt had first said he would reverse the 300 truck limit in 2017, but the White House asked him to do a more thorough investigation of the economic and environmental impacts of doing so. Opponents of the plan have appealed to the White House to intervene again, according to the New York Times.